In an effort to tackle the organ donor shortage, researchers in the United States have successfully created part-human, part-pig embryos and implanted them into a sow. Eventually, these animals could act as incubators for human organs, which concerns some ethicists. As reported by the BBC, researchers from the University of California, Davis, injected human stem cells into pig embryos to create the chimeras (the word “chimera” is derived from mythology, but it’s the scientific term used to describe an animal that has genetic information from more than one species). The human-pig embryos were then implanted into a sow, where they will be allowed to develop for 28 days before the pregnancies are terminated (the full gestation period for pigs is 114 days). The scientists will analyze the fetal tissue to make sure everything is developing normally. In September of last year, the US National Institutes of Health said it would not fund this type of research until more was known about the implications. Even though the pigs are supposed to develop as normal pigs—save for the human organs—there’s fear that something unforeseen could happen, and that the pigs would somehow be humanized. There’s particular concern that the genetic material from humans might cause the chimeric pigs to develop human-like brains, but experts believe this is unlikely. Undaunted by the NIH’s concerns, several labs are now working to make this a reality. Human-pig embryos have been created before, but this marks a first for the UC Davis researchers. To create the human-pig embryos, the researchers used CRISPR to knock out the genetic information required for the fetus to grow a pancreas, resulting in a genetic “niche.” To fill the void created by process, the scientists then injected human induced pluripotent (iPS) stem cells into the embryo. Theoretically, this should cause the pig embryo to grow a human pancreas. In the future, such pigs would be allowed to mature, and would later have their human organs harvested. In short, they’d basically serve as incubators for human organs. The current work is focused on the pancreas, but other organs could also be grown, including hearts, livers, kidneys, lungs, and corneas. There’s no question that something needs to be done about the ongoing organ donor shortage, but this solution already seems a bit anachronistic. This concept, originally known as xenotransplantation, has been around since the 1970s. 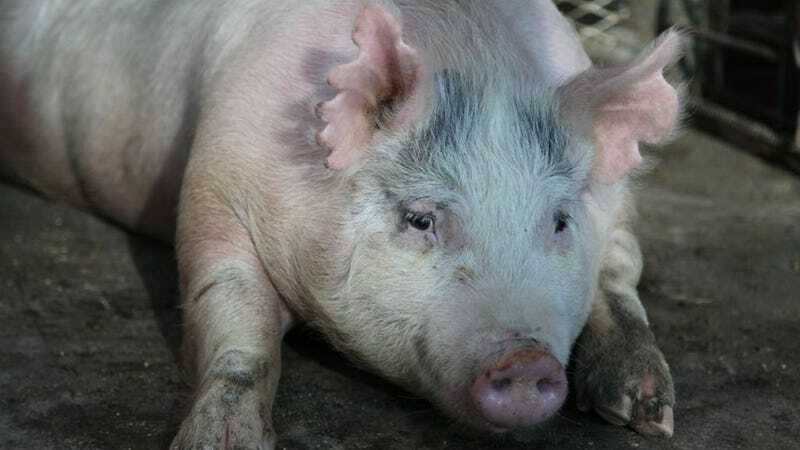 By the 1990s, there was hope that GMO pigs could be used en masse to provide an almost unlimited supply of organs for patients, but research stalled due to fears that humans might be infected with animal viruses. The advent of CRISPR has revitalized this line of research because biologists can now selectively weed out these undesirable retroviruses. He’s not wrong; this quasi-dystopian solution seems like a major step backwards. And indeed, there are other research efforts currently underway that won’t require the use of animals, such as bioprinting, advances in cold storage, and the promising field of regenerative medicine where biologists can literally grow a patient’s organs in the lab. So yes, let’s continue this line of research into human-pig chimeras—it’s probably the best short term solution that we have. Research into this area is developing quickly, and it’ll likely be available sooner compared to the other research efforts. But let’s go about this with the understanding that it’s a stop-gap measure and not a long term solution.